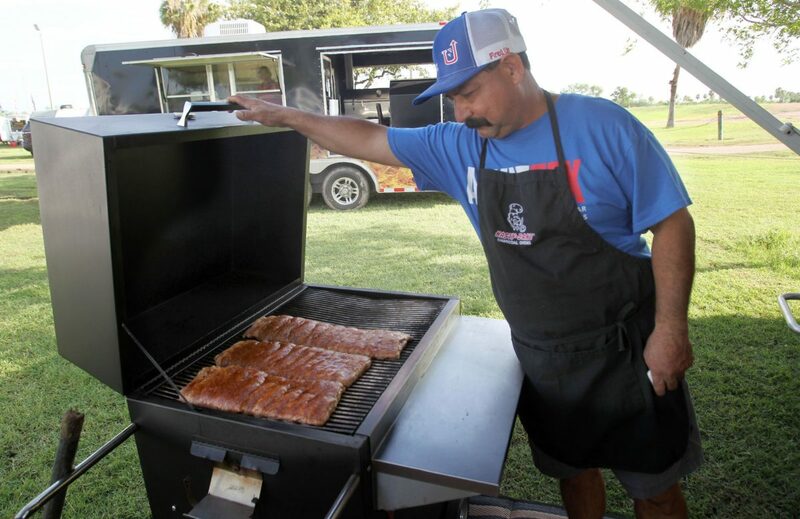 Arnie "Tex" Segovia checks on the spare ribs during the 13th Annual High Steaks Cook' em competition on Saturday, July 7, 2018 in Edinburg. Arnie and his wife, Terry compete in countless barbecue competitions through out the state. EDINBURG – For Arnie and Terry Segovia, planning and strategizing for the 13th annual Texas Cook’em: High Steaks on Saturday comes as easy as bread and butter. The husband and wife partnership roots from Arnie, who says grilling and competing is his passion. The pair arrived at Edinburg Municipal Park on Friday, began preparations and set up that afternoon before the big day. “The rules say you have to prep on-site, you can’t bring everything ready to go, so we prep in here (in their RV) and that’s why we show up early because that way we can get in early Saturday morning and start cooking and everything is ready to go,” Arnie said. The all-day event sponsored by the Chamber of Commerce with several other entities brought plenty of carnivores to the park to judge the entries which included chicken, spare ribs, steaks and brisket. Arnie "Tex" Segovia gets half chicken ready for grilling on Saturday, July 7, 2018 in Edinburg. Half chicken injected with secret sauce during the High Steaks Cook'em Competition on Saturday, July 7, 2018 in Edinburg. 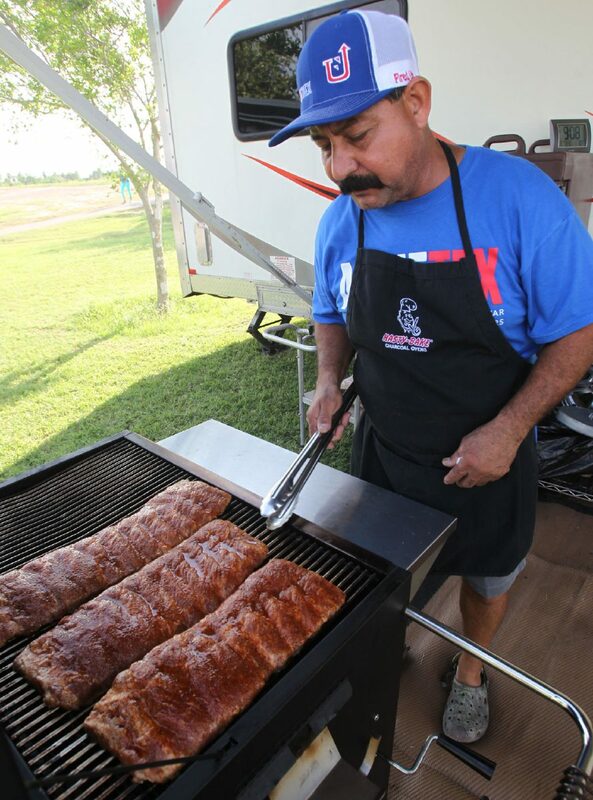 Arnie "Tex" Segovia checking on the spare ribs on Saturday, July 7, 2018 in Edinburg. A 16 lb beef, brisket on the barbie since 7;45 am will cook for 6 hours at the Arnie "Tex" Lone star booth on Saturday, July 7, 2018 in Edinburg. As part of their setup, the Segovias from Edinburg brought their small RV to the park, where they camped out overnight for an early rise Saturday. 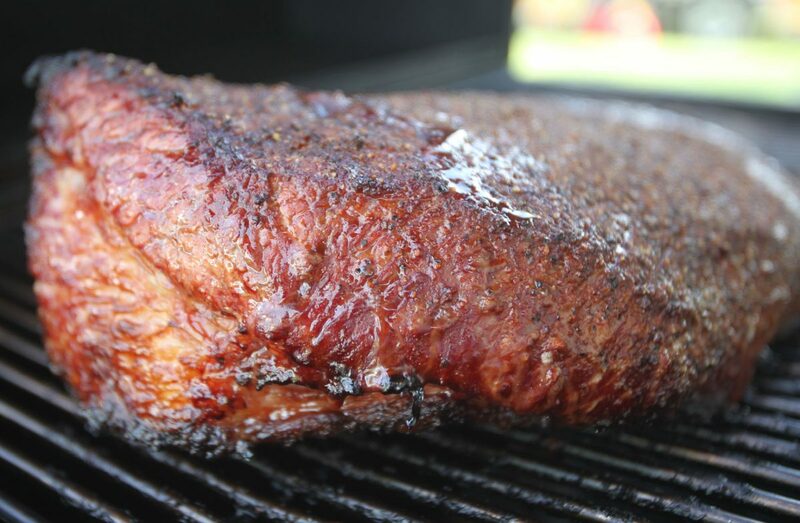 The day began about 5:30 a.m; turning on the barbecue pit by sunrise and the brisket was cooking by around 7:45 a.m., as it usually takes a longer period of time to cook before the judging begins at noon. The Segovias have been participating in cooking competitions for approximately 20 years while Arnie was still a manager at a local car dealership, and with just six years under his belt, he is now a full-time cook. “This is our job. We travel, do classes and do competitions, we have a good time, it’s all fun,” he said. Some of the participating cities in Texas have been Houston, Lubbock, Del Rio, Laredo, Austin area and Lockhart amongst others. He has also won competitions during his time, some being championships, others just making it to top 10 on a yearly basis. As Arnie prepared the meat and poultry before judging, he made sure the moisture was contained through the cooking time to prevent it from dryness. In addition, he also uses his own special ingredients that each cook may have. In 2016, he was named the top brisket cook in the state of Texas out of 1,000 teams. Terry also enjoys accompanying her husband during trips and traveling with him. Arnie does say he relies on Terry for the taste of certain foods as she has a different palette, depending if something needs seasoning or not. After cooking for several years, he does feel like stopping, but loves what he does and that what drives him forward. “We are trying to slow-down and take a break because it’s like a job doing it every day. For us it’s every weekend, not so much the cooking and the camaraderie – all that is awesome,” the 56-year-old said. “It’s just getting ready, finding the meat, driving around, getting loaded and because life has its challenges everyday for everybody, it’s always something. During his tenure as a griller, he feels like he learned from the best by generations before him and now besides participating in competitions, he passes on what he has learned through teaching classes around the state. “They’re so many people that didn’t grow up cooking like I did,” Arnie said. “My dad and grandpa barbecued, so I’m fortunate that we have that background, but a lot of people don’t have that. “People who grow up in the city and their parents worked or single parents, they didn’t have that option and now that they’re grown up and have jobs, they want to cook good barbecue and want to do it at home,” Arnie explained. Luck plays a key role in competitions, according to Arnie, who cooks most of the meals. The city of Edinburg also received a special surprise during the 13th Annual Texas Cook’em: High Steaks that will place a spotlight in the city. Earlier this year, a Los Angeles production company reached out to Austin Company, Captiva Entertainment Group LLC and was asked to come up with a barbecue television show. 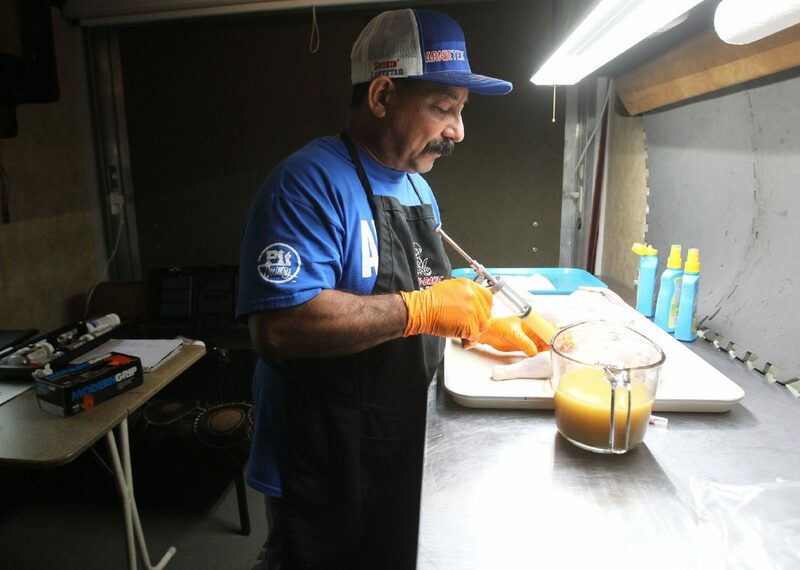 After months of brainstorming, the show will be called “TX BBQ Trail,” and will feature Edinburg’s event as part of the series with host Ernest Servantes, a world champion pit master from New Braunfels. A crew filmed Friday and Saturday for the episode that is expected to air sometime in late fall or early winter. The show will begin on the streaming channels before moving to traditional cable, and hopefully will be picked up on local affiliated channels within the state. “The show will showcase backyard competitors and the Texas barbecue culture, and be a learning experience and spotlight the Rio Grande Valley,” said Chris Perez, owner and president of Captiva Entertainment Group.